The Lace Front Wig Q&A - Is it right for you? Is a Lace Front Wig Right For Everyone? "Can anyone wear a lace front wig?" Here are the first of some quick fire lace front wig questions; so if you’re wondering if lace wigs (lace front or full lace) are for you, you’re in the right place. Anyone can wear these types of wigs, whether you have a lot of growth hair or hair loss. "How are they different from lace frontals and full lace wigs?" 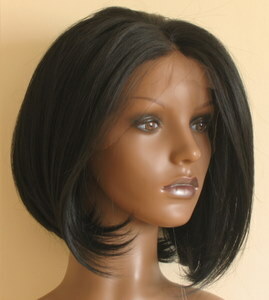 We often hear people refer to lace wigs as a lace frontal or a lace front as though they are one and the same, but there not although the wig caps all have lace as part of the cap construction. A lace front wig has lace at the front and sides towards the ears only. In other words, they usually only have lace around the hairline around the front of the wig; but there are different cap constructions so you can choose to have clips and combs, silk tops or go for those that don't use adhesive (glueless lace wigs). A lace frontal, is similar to a half-wig in that it is a small hairpiece that is attached to the front of the head and is often used by people who have a receding hairline or who have thin (or thinning hair) at the front. A full lace wig has lace all around the perimeter of the wig. As full Lace Wigs have lace around the whole perimeter of the cap, if you were to wear it in a high ponytail it would not look like a wig at all – it has an invisible hairline. There's more information on the different types of lace you can look at our lace colour page or articles on the differences between Swiss lace and French lace. "Who can wear lace front wigs?" The great thing about lace wigs, be they full lace or lace front is that they can be worn by anyone. People of all nationalities can wear them as they come in all hair types and textures. As our site grows we'll recommend which wigs are suited to different people if you’re wearing a Peruke because you have to and not because you just feel like changing your look. These recommendations are just that, recommendations. It’s your Peruke and your look so ultimately you will choose what you feel best suits you. Just how it should be! Lace wigs are also for men and we’ll have a whole section dedicated to these hairpieces which will use the lace system as well the standard hairpiece system. Lace wigs can be worn by anyone of any age. Individuals with hereditary hair loss or medical conditions resulting in hair loss will find a Lace Wig a good choice. Like high profile personalities, many people elect to wear Lace Wigs to change their style. As lace wigs are available in many styles and colours, they can be worn without making changes to growth hair. "Is it easy to spot a lace front wig?" Once you apply your lace wig, the hairline is invisible and with baby hairs it’s even more natural – as most people have short wispy hairs (baby hairs) around their hairline. The best way to make sure that your lace wig can't be spotted, it to wear the hair down, or tied back in a low ponytails. These types of cap constructions mean that the wigs (generally) can't be worn in high ponytails as the wig hairline will be readily visible at the back - just like an ordinary wig (but with some nifty hairpin work, you can sometimes get away with wearing a messy high bun as the loose strands can cover the nape of the neck). "How long do lace front wigs last?" If you look after your wig properly then your lace wig can last for at least a year... That's right a year. That's what makes lace wigs such a great investment. That's the leap through lace front wigs wrapped up.